An Israeli guard has shot dead a Jordanian who attacked him with a screwdriver next to the Israeli embassy in Jordan, Israeli officials say. A second Jordanian was inadvertently killed in the gunfire, Israel says. The guard was reportedly wounded. The attacker was a carpenter working in a residential building used by the embassy, an Israeli statement said. It is one of the most serious incidents between the two countries since they signed a peace treaty in 1994. The second Jordanian, who died from his wounds in hospital, was identified as the building’s landlord. 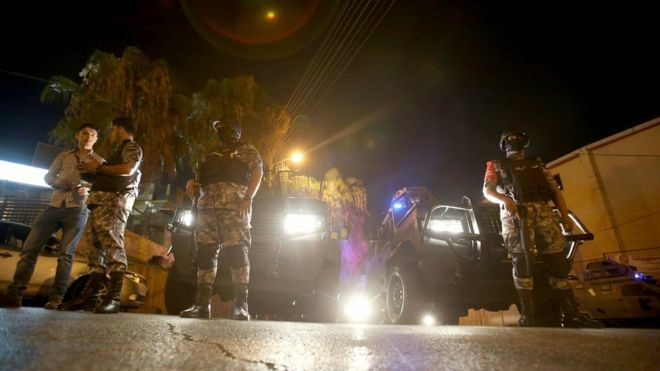 Jordanian police have sealed off the area around the heavily protected embassy in the Rabiyeh neighbourhood, an affluent part of the capital city. According to the Vienna Convention of 1961 the security man has immunity from investigation and arrest, the Israeli foreign ministry said. The incident came at a time of heightened tension in the region over a Jerusalem holy site. On Friday, thousands of Jordanians protested in Amman against Israel over the installation of metal detectors outside a site sacred to both Muslims and Jews in East Jerusalem. Jordan, which occupied East Jerusalem from 1949 to 1967, is the custodian of the site, which is known to Muslims as Haram al-Sharif and Jews as the Temple Mount. Tensions between Israelis and Palestinians over the site have surged in recent days in response to the metal detectors, which were put in place following the killing nearby of two Israeli policemen.